A classic torchiere floor lamp with a convenient glass table and adjustable reading lamp. I love that there are three different functions for it. I need them all. We have a similar lamp in a tight space between two pieces of furniture where my husband reads the paper. He wanted to be able to set a glass down on a table in that space and still be able to have a reading lamp in the same space. Provides both room illumination and a reading light with the bonus of a small table. I need a good reading light and I liked the table. Appears to be a quality product. It will enhance the atmosphere of my dining room. It will not take up a lot of space but will add ambiance in the corner of the room. I needed a lamp that would be tall enough for my tall bed, but not too tall for my 7.5 foot ceilings. I like that it has the tray, since I won't have a nightstand on that side. I came in wanting the floor lamp with reading light. Once I saw the table option combined with this, and realized it would work well with my space, there were no other options that came close. This is perfect. I liked how it had a little table with the lamp. I choose this because i found it very useful every part. And i found it very nice. Ideal for the living room where we want extra light with out a big footprint. The task light may end up being an art spot light! Super useful to have the little table there too. nice clean look, takes 150 W bulb for room lighting, which is important for us older folks! 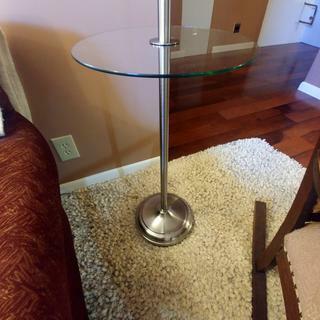 It will take 150 watts; the table and reading lamp are nice extras for our small living room. I like the alabaster glass. I wanted a reading lamp with a table in my guest bedroom. The finish on this lamp matches the other lamps in the room and drawer pulls on the dresser. This lamp is practical and attractive, and the torchiere light is a bonus! BEST ANSWER: Hi - The glass is not designed to be left out of the installation. But, try one of the other options below that you may like. Yes the glass table was separate in the package then you place it upon installation so I’m pretty sure it can be optional. However, the glass table is what I really liked about this unique lamp since the table is very useful and quite attractive. The glass table is hardly noticeable since it’s transparent. Yes, because the cord already runs through the straight pole. You can follow the pictures that are provided. Very to assemble, takes 10 minutes at most. Are the 2 shades glass? BEST ANSWER: Yes, they are glass shades. Yes, it is a beautiful frosted glass with slight white lacy strokes. I put it in my son and daughter’s bedrooms, and they absolutely love it. Glass table very sturdy and lamps give plenty of lighting. Yes. They are a frosted glass with some randomly placed lines running through to add visual interest. The glass is actually quite pretty. Yes, not like the table top but they are not plastic and can break. They look very pretty. Hope this helps. 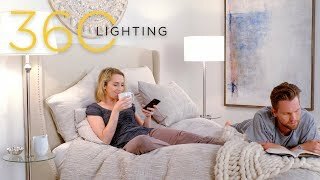 Is the reading light adjustable/swivel? BEST ANSWER: Yes - the side light is adjustable. Yes the reading light goes up and down and side to side. Yes. It can move up and down and right and left. Do you have it in bronze? BEST ANSWER: No - but I have added a link below for some other possible options available in a bronze finish. Can a 3-way bulb be used in the lamp? BEST ANSWER: No, this does not use 3-way bulbs. This includes on/off switches for each light. Mind does not, only clicks once. But I have a energy saving light bulb so not sure if that has to do with anything. I really like it, very pretty and just the right size for a small stand to put your book on and lights up very well. I’m sorry i dont know. I am very happy with the lamp. What material are the globe's? BEST ANSWER: The globes are made of glass. They are a frosted glass with some swirls where the frost is heavier. Adds interest to the globes. what is the width of the globe? BEST ANSWER: Hi Elizabeth - If you're referring to the round glass shade on top, it is 11 1/4" wide. The width is about 11 inches wide. Can you use any watt bulbs? BEST ANSWER: Hi - well, there is a limit on the bulb wattage. The top light takes a maximum 150 watt standard base bulb; the side light takes a maximum 40 watt standard base bulb. No they give you a maximum but I even went down in wattage as it is very bright. BEST ANSWER: The frosted glass globes are white. What are the tray table dimensions? BEST ANSWER: Hello - The table dimensions are 14 inches wide, and 28 inches high from the floor. 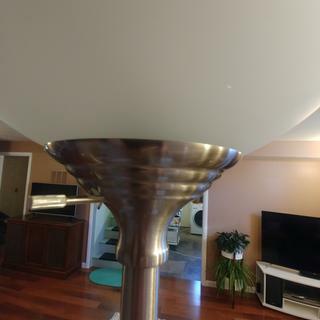 What socket type does the top lamp take? BEST ANSWER: This lamp takes standard base bulbs on both the top and bottom lamp. Attached is a 150 watt bulb that can be used in the top lamp. PRODUCT EXACTLY AS DESCRIBED. NICE LAMP STAND, BUT IT DOES NOT HAVE A THREE WAY SWITCH. I WAS TOLD IT HAD A THREE WAY SWITCH, WHICH I WANTED, IN ORDER TO DIM. Great lamb and just right for coffee and a book. Lights up nice. Love the look. Design and function blended into one floor lamp. Works well next to my comfy chair in that favorite corner. Bright White LED bulbs add a clear coolness to the light. 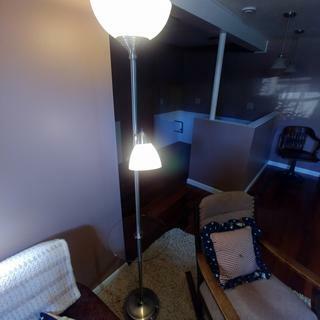 We wanted an inexpensive floor lamp with table for a small space next to our sofa. This fit the bill perfectly. I was pleasantly surprised how well it was packaged. It arrived on time and was easy to assemble. Very practical and efficient product. It fits perfectly in a corner and provides good lighting. The glass table is a useful addition. First of all I am a perfectionist so keep that in mind. This lamp is as described. It looks nice and casts light nicely. I like indirect lighting and this torchiere lamp does just that. The switch to the top light was bent and would not rotate straight. Had to tweak it a bit. Also, that switch is not a 3-way so to receive the proper desired lighting is by bulb wattage only. The threaded seam between the two lengths of body tubing annoys me but a lamp [...] need to shipped and packaging needs to be compact so just have to accept it. The base of the lamp looks nice but of course is just a tin pressed plate covering up a sand filled plastic tub as the lamps counter-weight. No cast iron counter-weight like the great lamps of old. 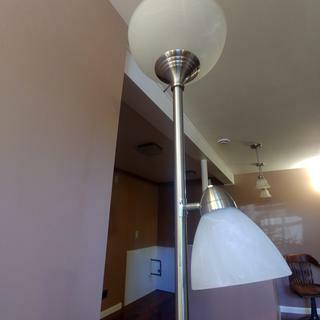 Yes, you get what you pay for but this is a nice looking lamp for the money and ii used in my basement family room. Not sure it is worthy of presentation in a living room. Great product!!! Excellent style that compliments any room. Delivered in perfect condition, and exactly what I wanted. This light works well for where we need it as not a lot of room for end table. Wish the base was a little bit more sturdy as wobbles a bit. Hi Carol Z., we appreciate the review. We're so glad to hear you're enjoying your lamp, but we apologize for the slight wobbling issues you're having. We would be happy to see if this is something we can help troubleshoot, so could you please reach out to our customer service team via phone, email, or chat? Thank you. Based on retro tree-style floor lampsthis 3-light design features a sleek and stylish aged brass finish. A sleek brushed nickel finish brings a lovely sheen to this twin pull chain floor lamp topped with a stylish natural burlap fabric drum shade. Brighten bedroomliving roomor family room decor with this elegant twist floor lamp and designer creme fabric bell shade. 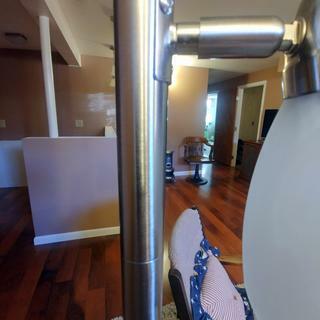 A modern three-light floor lamp with a minimal form and mix of black and brushed nickel finishes.